Delta Thermo Energy is the first company to prototype and build a commercial-scale Green Waste to Fuel™ facility in the United States. This is integrated together using a patented and patent pending processes that together may be called Hydrothermal Decomposition. 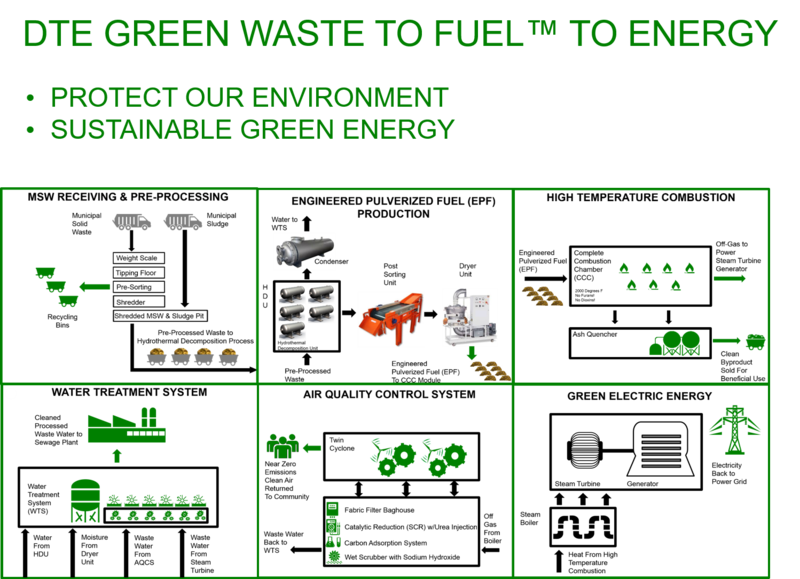 Delta Thermo Energy Green Waste to Fuel™ technology utilizes a number of previously proven technologies that have been used in Asia and Europe for MSW and sludge processing and has brought these together to form the Green Waste to Fuel™ process architecture. The thermal processing system, known as the Resource Recycling System (“RRS”), was originally developed by the Hokuto Kougyo Co.(Hokuto) of Japan, one of our key partners, for the disposal of hazardous hospital (red bag) wastes. The Complete Combustion Chamber system (“CCC”) a technology developed by Jasper in Germany, another key partner, is used for the combustion of processed waste such as MSW, biomass and industrial wastes. The RRS system generates wastewater which must be treated before discharge to a municipalities wastewater treatment plant. The Waste Treatment System (“WTS”) is a technology developed by ETC of South Korea for the treatment of industrial wastewater. Delta Thermo also incorporates conventional equipment for receiving, sorting, shredding and storing MSW and sludge prior to treatment and combustion as well as conventional heat recovery and steam turbine equipment for recovering useful energy from the combustion process. A highly advanced air quality control system is also incorporated. Delta Thermo Energy’s Green Waste to Fuel™ process brings the first truly sustainable solution for waste processing to the United States. The United States is facing very difficult environmental challenges. Our land is overflowing with legacy waste processing techniques, a dwindling quantity of shrinking and what many environmentalists would view as unhealthy landfills and the related waste processing by-product pollutants which threaten our air, water and food chain. Our patented technology brings a sustainable bridge to a healthy environment from the clean processing of waste through to the delivery of electrical energy. DTE Green Waste to Fuel™ technology processes both municipal solid waste and sewage sludge with near Zero Emissions. As by-products, we produce DTE Engineered Pulverized Fuel (EPF) and then electricity. Other than initial startup, this integrated process requires no fossil fuels to operate the facility. This innovative solution has been developed by Delta Thermo Energy by combining a variety of trade secrets, patented and patent pending technologies from partners in Japan, South Korea, and Germany. Delta Thermo Energy facilities include all necessary equipment and systems to receive and process municipal solid waste (MSW) and biosolids into a prepared fuel (DTE Engineered Pulverized Fuel or EPF). EPF is then combusted to produce steam for the Resource Recycling System (RRS) process and for electrical power generation. Wastewater treatment and air pollution control. Carbon Adsorption system to control mercury (Hg) and VOC. Request our WHITE PAPER which overviews our process and the components involved in each step.